A never-ending party full of attractive people, drugs, and fresh oven-roasted chicken would be hell for some, heaven for others. For Nadia (Natasha Lyonne), the cynical game developer at the center of Russian Doll, it’s a (repeated) wake-up call. Russian Doll opens on Nadia staring glumly at her reflection in the bathroom of her friend’s impossibly chic, Yeshiva-turned-boho-paradise apartment. It’s her 36th birthday, an occasion that her impossibly cool friends Maxine and Lizzy (Greta Lee and Rebecca Henderson, respectively) are celebrating with the aforementioned drugs, hot people, and poultry. Instead of re-applying lipstick or checking her smoky eye (which remains perfect no matter what else happens), Nadia takes a ragged breath before plunging back into the bacchanalia, ready to live this night like it’s her last (spoiler: it both is and isn’t). In quick succession, Nadia hooks up with a stranger (Jeremy Bobb), searches for her cat, gets hits by a car, and dies in the street, only to find herself standing in Maxine’s bathroom once more, physically intact though hardly the same. To give away much more would take some of the fun but none of the resonance out of this half-hour series from Lyonne, Amy Poehler, and Leslye Headland. Like Groundhog Day, Russian Doll has a live-die-repeat conceit that traps its lead in limbo or possibly purgatory or whatever it is we’re calling time warps these days. 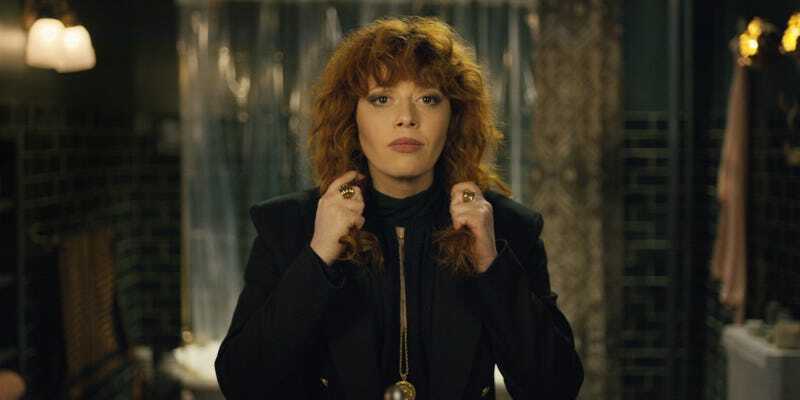 There are additional nods to that excellent 1993 comedy in Lyonne & co.’s story of a self-involved person being forced to look up from their navel, but a good deeds-paved path to enlightenment is just one of the shapes nested within Russian Doll. As Nadia figures out the rules of her seeming immortality, the show careens through any number of tones and genres—scathing yet empathetic; a comedy of manners and an existential drama—defying streaming-series convention by handling each one better than the last, proving that self-improvement isn’t limited to misanthropic New Yorkers. Unlike so many puzzle-box shows, Russian Doll doesn’t rely on its twists and clues, though there are plenty of those, all expertly deployed across each of its eight exquisite half-hour installments (conciseness—another area in which the show bucks programming trends). True to Nadia’s work, there’s even talk of Easter eggs and “impossible levels” to conquer. The central mystery—why is this happening to Nadia, and can she make it stop?—is as carefully constructed as any you’d find in your True Detectives and Westworlds, only more consistently gratifying. But playing armchair sleuth is just a small part of what will keep you following along with Russian Doll, which frequently finds ingenious and uproarious ways to stretch the confines of its temporal loop. There are far greater rewards in the characters, whom Russian Doll is smart enough to treat as more than totems. The show adds layers to Maxine and Lizzy, one party hangover at a time, while also introducing Alan (Charlie Barnett, who manages the impossible task of keeping up with Lyonne), a repressed fellow thirtysomething who finds himself caught up in whatever is happening to Nadia in the East Village, and John (Yul Vazquez in sad-sack mode), Nadia’s oblivious ex who’s stuck in his own cycle. And though the clock is regularly reset, the relationships between new friends and old grow with every drag from a cocaine-laced joint, helping us to see why Nadia alternately views her predicament as a punishment and opportunity. But as the latest iteration of the chain-smoking, hard-drinking, disillusioned searcher, Nadia is the fulcrum from which Russian Doll takes all of its biggest swings, which connect at a rate unseen in any other mystery-with-an-enigma-and-riddle-on-top shows. She’s a self-described amalgam of “Andrew Dice Clay and the girl from Brave,” with shades of Rust Cohle and Search Party’s Dory. It’s not a pastiche but the role of Lyonne’s actual lifetime—Nadia’s arc is clearly informed by Lyonne’s time in Hollywood, which is presented here as an ongoing party with diminishing returns. All of the actor’s simmering potential and long history of scene-stealing are brought to bear here; Lyonne makes so much of every moment she’s on screen that the dime-turns in storytelling stretch into eternity. Her half-growled delivery and slightly slumped shoulders convey a world-weariness that’s betrayed by her unquestioning kindness to cats and gutter punks. Ever-changing though her surroundings may be, we never lose sight of Nadia; if anything, she comes more fully into view. In a story that’s as much about the comforts of routine as it is breaking self-destructive patterns, Nadia is no mere vehicle for some convoluted plot—she’s a lifeline. The all-woman team behind Russian Doll—which, aside from Lyonne, Poehler, and Headland, includes director Jamie Babbit—know just how special their lead is, and craft a story both worthy and reflective of her. As much as we might like her, Nadia is deeply flawed, so there are no beelines to betterment, no bromides to dull the show’s stinging humor. The irregular intervals for resets and canny shifts in perspective keep the uniformly great cast on their toes, as well as the viewer; like Black Mirror: Bandersnatch, this generates a sense of interaction, that maybe we’ve pieced together a different Nadia than someone else. But where the end of that choose-your-own-adventure story (a term we’re using for the sake of expediency, not to bolster anyone’s lawsuit) didn’t amount to more than the sum of its parts, Russian Doll’s investment in its characters makes it a binge-worthy show that demands an immediate rewatch.